OxygenOS 2.2.2 For OnePlus X is now officially available. The new update comes with lots of bug fixes and security patches. Lots of OnePlus X users are who are complaining about lots of issues on the phone are now happy. This new update will fix all the problem in the Phone which Oneplus X users are facing from a long time. The update is already rolled out, and most of the OnePlus X users already received the OTA update on their phone. If you are the rooted Oneplus X user, then you have to manually flash this update on your phone. Below is the full tutorial which you can follow on your phone update the same with OxygenOS 2.2.2 update. The new update is based on the Android Lollipop 5.1.1, and this makes most of the users unhappy. Because most of the user are waiting for the Android Marshmallow. Here we provide you the OxygenOS 2.2.2 ROM which you can flash on your device. The guide is only for the OnePlus X users and don’t use this method on any other OnePlus Phone. 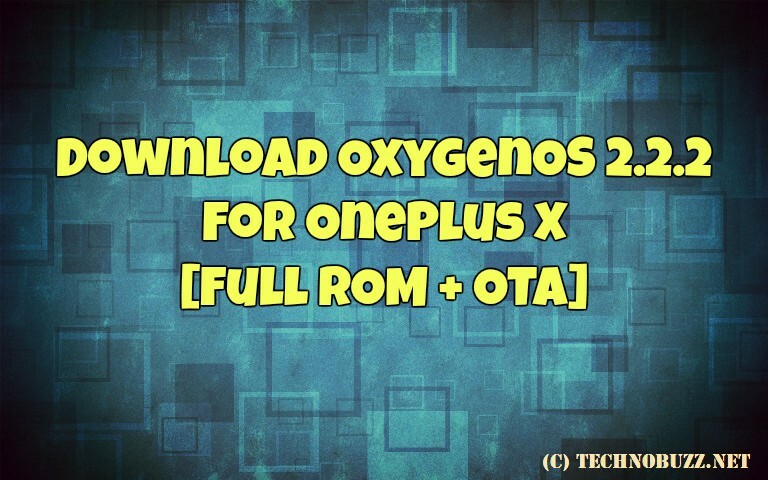 So let’s take a look how to install OxygenOS 2.2.2 For OnePlus X. Warning: Tecnobuzz.net is not responsible for any damage that might happen to your phone during this process. b) Backup OnePlus X before flashing the Update. Step 1. Once you download the appropriate OxygenOS 2.2.2 ROM zip file. Place that zip fiel on your phone’s internal Merory. Step 2. Now boot your phone in Recovery Mode. To do this, first swithc off your phone and now press and hold “Volume Down+Power Button”. Step 3. Once your phone in recovery mode. Wipe data and cache if you want a clean installation otherwise skip this step. Step 4. Now tap on the “Install” Button and locate the zip file that you saved on your phone on step 1. Step 5. Now wait until the installation complete. Step 6. Once completed. Reboot System. Now your Oneplus X will boot and run on the latest OxygenOS 2.2.2 update. If you have any, doubts comment below.